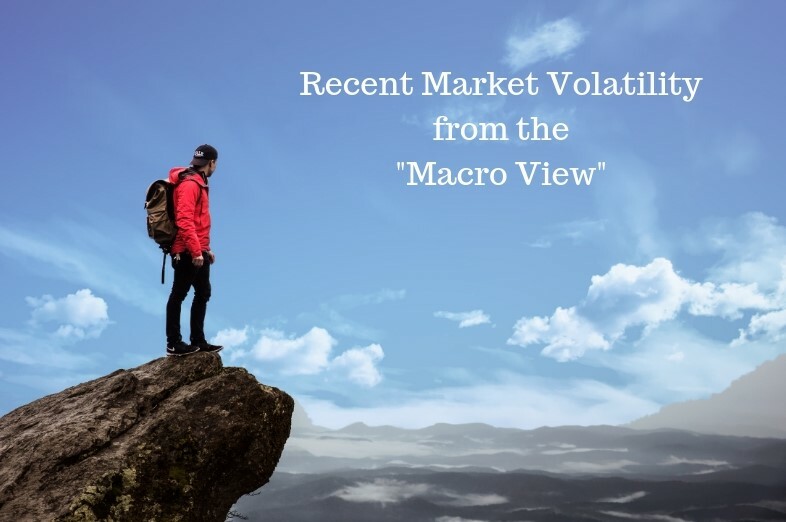 Looking at the Recent Market Volatility from the “MacroView” | MacroView Investment Management, LLC. We have started working on our 4th quarter 2018 Market Commentary that will be published in the first two weeks of January. However, we wanted to share some thoughts prior to the holidays to help you better understand the recent market volatility to ease any fears you may have and so that if the topic comes up in conversation with friends and family you will be in a position to impart some wisdom. US stocks experienced a correction over the last few months. The S&P 500, which is made up of large-cap US stocks, has fallen over 15% from its high on September 20th of this year and is at its lowest point since September 2017 wiping out all gains since that time. The chart below shows the S&P 500 in 2018 as of December 20th the index is down almost 6% YTD on a total return basis. While this all sounds very negative and potentially alarming, volatility and market swings of this nature are not uncommon. The anomaly has been the current 10+ year bull market where we have seen very little volatility making investors hyper-sensitive to the current environment. The trading range from peak to bottom for the S&P 500 this year is 17.4%. The average annual trading range since 1950 is approximately 23%. Since 1960, the S&P 500 has averaged 53.5 days per year where it moved up or down more than 1%. 2018 has seen 51 of those days. Thus, 2018 fits within the historical norm of equity market volatility. Think about hiking up a mountain…along the way there are viewing areas where you can look out over the horizon. The longer and further you climb, the more anxiety you feel at each overlook and the mind and body’s natural fear mechanisms kick in as you become more sensitive to your surroundings. The wind blows and the hair on the back of your neck stands up as if to remind your feet to stay planted on the ground and not be blown over the ledge. Economic growth accelerated over the last year thanks to the tax cuts and continued low interest rates. The impact of the tax cuts will fade in the coming years, interest rates are rising, and we are basically at full employment – the result is an expected deceleration in economic growth, albeit still positive (not a recession). The story this week was the Federal Reserve’s decision to raise the Federal Funds rate and, perhaps more importantly, their comments that they intended to continue raising rates in 2019. Current expectations are for two more rate hikes in 2019. The irony is that by doing this the Federal Reserve is making the statement that they believe the economy is strong enough to stand on its own and doesn’t need the “training wheels” of low interest rates to stimulate it. Without clarity businesses all over the world find it hard to engage in investment spending to grow their businesses. We have been on a very long climb and it is only natural and rational to ask when will it end. Economic growth will slow down but it should remain positive. Rising interest rates and fading tax stimulus will most likely slow corporate earnings (profits), which have been on a sugar high in 2018, but they too should remain positive. We don’t believe that any side wants a full-blown trade war and any positive news from the negotiations should be positive for markets, however we can’t ignore an alternative outcome. We will cover all of these in more detail in our January commentary. Long-term investors should not be overly concerned about any of this because even if the worst-case scenario of a full-blown recession occurs, we believe their portfolios will recover. As your advisors, we have been actively re-balancing portfolios. We have had a slightly defensive posture in most portfolios with higher cash levels, bonds and defensive alternative positions. Most portfolios remain broadly diversified with a conviction to international stocks that have suffered this year but look attractive relative to the US long-term. We will continue to look at alternative investments as non-correlated assets and to deploy cash strategically as opportunities arise.